Wielkiej Brytanii, Niemiec, Iranu, Polski i Snegalu celebruje kolor niebieski. Niebieski zdaje się być najpopularniejszym kolorem według przeprowadzanych ankiet. Jest kojarzony z zaufaniem, spokojem i jednością. W sztuce i popkulturze wiele przykładów natychmiast przychodzi na myśl: od “niebieskiego okresu” Picassa i prac Yves Klein’a po międzynarodowe marki takie jak Facebook, IKEA czy Nivea. Aleksandra Frankowska, Rodney Dee, Mindy Lee, Line Krom, Max Pauer, Niloufar Shiriani, Krzysztof Ślaziński, Susan Sluglett oraz Mamadou Touré aka Béhan podchodzą do różnych wymiarów koloru niebieskiego w sbosób techniczny, metaforyczny i zmysłowy. Podczas gdy obrazy wpisują się w podstawy teorii koloru, fizyczność niebieskiego może być właściwie skonsumowana za pośrednictwem pokazanych rzeźb. Tytuł Once in a blue moon odnosi się do angielskiego zwrotu, który oznacza wydarzenie pojwiające się niezwykle rzadko. W astronomii blue moon, czyli dodatkowa pełnia, to zjawisko, które obserwujemy raz na 2,4lata. Nakreślając motyw przewodni wystawy – niecodzienne wydarzenia – kuratorzy zapraszają do przynoszenia niebieskich przedmiotów, które wraz z dziełami sztuki współtworzyć będą bazar we wszystkich odcieniach niebieskiego. Prace artystów oraz przedmioty przyniesione przez odwiedzających można będzie nabyć w galerii. Galeria OFF Piotrwska proudly presents the upcoming group show „Once in Blue Moon„. Aleksandra Frankowska, Rodney Dee, Mindy Lee, Line Krom, Max Pauer, Niloufar Shiriani, Krzysztof Ślaziński, Susan Sluglett and Mamadou Touré aka Béhan – a selection of nine artists from Great Britain, Germany, Iran, Poland and Senegal revel in the colour Blue. Blue appears to be the world’s most popular colour according to surveys. Blue is associated with trust, serenity and union. In art and popular culture many examples immediately spring to mind such as: Picasso’s „blue period„, Yves Klein’s blue monochromes and multinational blue branding used by Facebook, IKEA and Nivea etc. The title „Once in a Blue Moon“ refers to an English saying meaning a rarely occurring event. A blue moon, a full moon occurring twice in a calendar month, only arises every 2,4 years. Picking up on the rare occasion as leitmotif the curators invite the public to submit blue coloured everyday objects building a bazar in all shades of blue. Both art works and everyday objects will be on display and for sale in the gallery. Dieser Eintrag wurde veröffentlicht in Uncategorized und getaggt mit Aleksandra Frankowska, Krzysztof Ślaziński, Line Krom, Mamadou Touré aka Béhan, Max Pauer, Mindy Lee, Niloufar Shiriani, Rodney Dee, Susan Sluglett am 29/08/2015 von adeuxinstant. 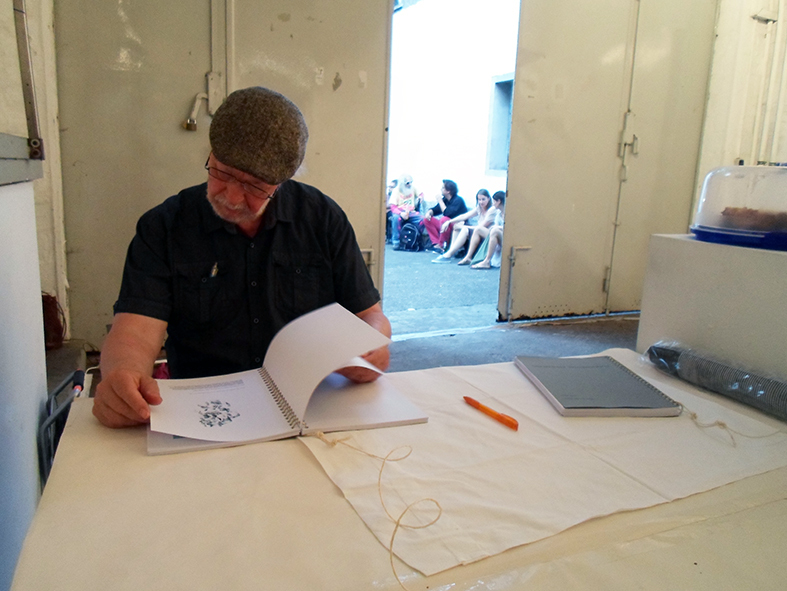 From Tuesday July 14th to Friday July 17th 2015 the international mail art exhibition Fundamental Ephemeris II took place at the Exhibition hall of the Goethe University Frankfurt at the Department of Art Education. 30 artists from Europe, USA, Asia and Africa were invited to send their works by mail to the exhibition space. The drawings, paintings, photographs, sculptures and video works were all kept within the format of 21 x 29,7 cm (Din A 4), small enough to be sent by mail. In 2013 my partner Jutta Heun and me initated the Mail Art Project “The Magic Cube” in 2013. Curious to find out what the informal exhibition format would have to offer in the area of globalisation and e-mail. (There will be some reflections on that topic in the catalogue Fundamental Ephemeris accompanying the exhibition. Going to be published by the end of August 2015.) In September of the very same year we organised our first mail art group show with works of 32 international befriended artists at the Bronx Art Space in New York. Friends from Europe and the Americas send their works to New York. The art works were on display from 1st to 14th of September 2013. (Further information here). Now two years later with the support of the Department of Art Education and Prof. Dr. Adelheid Sievert head of the Alumni Association of the Department Jutta Heun and me received the opportunity to organise another group show inviting art practitioners from around the globe to present their works at the Exhibition Hall of the Goethe University Frankfurt. Like in the first show “Fundamental Ephemeris” the exhibtion’s theme is “Time” in a very broad sense. The submitted works deal with the topic in various ways. Following I will give a few examples. The relationship between the photographic image and time became quite a big aspect of this exhibition. Images in a sequence can form to a moving image which we all know from the cinema. Image in a sequence is the topic of Pirjo Pulkkinen’s work “Aika Liikeh” (2015). Faris Barakat presented excerpts of his image archive of the Israeli Westbank Barrier. He shot his photographs for eight years in a row, each year between 2005 to 2013. Khaled Barakeh withholds the image from the viewer – no one except the artist himself knows what depiction is hidden behind the cryptic code of the gallery note. An artist embracing the moment is Mamadou Touré aka Behan, who is based in Dakar while travelling through Frankfurt captured precious and fragile moments of live and joy. The reoccurring of death in life is also an important aspect of the exhibition, Alexander Bühler quotes the “Danse Macabre” of the Mexican Day of the Dead, Carolyn Flood reflects in her very personal work on the relation between mother and daughter, which she considers as “ties which can produce the feeling that her life spreads out through generations.“ (C.F., 2015). Florence Bechu’s poetic video work “Le Dernier Soupir“ caputures the last breath. Either as an ongoing orgiastic phantasy or terrifying never ending nightmare one could describe the works of Max Weinberg, Wolfgang Klee and Annegret Soltau. In contrast Bas van Wieringen reflects on the postitiv aspects of the “what happend if” in his video “Possibilities”. From different perspectives the artists Yoonjung Kim, Line Krom and Marina Cerea take repetition as an agglomeration of time into account. René Schohe focus on the ephemeral and immediate. His work “Sound Schnecke (Sound Snail) (2015)” is sound responsive to it’s surrounding. Dirk Krecker’s retro-like typewriter images visually recall a pre-computer or maybe an early DOS-era. Both artists Dirk Krecker and René Schohe also work with sound. On Friday night René Schohe, Philipp Russeger and Peter Fey presented their sound project Messy Brothers fusing electronic avant-garde, club music and classic cello. They were followed by Dirk Krecker and his collaborator Martin Bott, who together form Monorain. They presented live-electronic. Hardware only. No presets. A catalogue featuring the art works of 60 artists presented in both shows will be available end of August 2015. Texts by Aline von der Assen and Jutta Heun. Art works by Geza Adasz, Faris Barakat, Khaled Barakeh, Walli Bauer, Florence Bechu, Christoph Borowiak, Alexander Bühler, Marina Cerea, Linda Cunningham, Eric Decastro, Robyn Doty, Sibylle Feidt, Carolyn Flood, Aleksandra Frankowska, Charles Geiger, Raul Gschrey, Dede Handon, Jutta Heun, Cordula Hofmann, Dieter Hoffmeister, Max Holicki, Ina Holitzka, Won-Seok Hong, Yoonjung Kim, Wolfgang Klee, Gudrun Klöckner, Eva-Maria Kollischan, Dirk Krecker, Line Krom, Jens Lay, Kerstin Lichtblau, Monika Linhard, Llobet & Pons, Mona Löffler, Nestor Madalengoita, Kate Mahony, Bernd Metz, Loizos Olympios, Rhea O’Neill, Max Pauer, Anja Priska, Zeesy Powers, Pirjo Pulkkinen, Anke Röhrscheid, Chris Shaw, Eva Scheuter, René Schohe, Susan Sluglett, Annegret Soltau, Wang Ip Sszto, Astrid Stricker, Mamadou Touré aka Béhan, Annika van Vugt, Friederike Walter, Max Weinberg, Eva Weingärtner, Birgitta Weimer, Bas van Wieringen Tammy Wolsey und Maha Zarkout. Dieser Eintrag wurde veröffentlicht in Uncategorized und getaggt mit Alexander Bühler, Annegret Soltau, Annika van Vught, Bas van Wieringen, Carolyn Flood, Dirk Krecker, Faris Barakat, Friederike Walter, Fundamental Ephemeris II, Jutta Heun, Kate Mahony, Kerstin Lichtblau, Khaled Barakeh, Linda Cunningham, Line Krom, Llobet&Pons, Mail Art, Mamadou Touré aka Béhan, Marina Cerea, Max Weinberg, Mona Löffler, Pirjo Pulkkinen, Raul Gschrey, René Schohe, Rhea O’Neill, Robyn Doty, Susan Sluglett, Tammy Wolsey, Wolfgang Klee, Won-Seok Hong, Yoonjung Kim am 03/08/2015 von adeuxinstant.